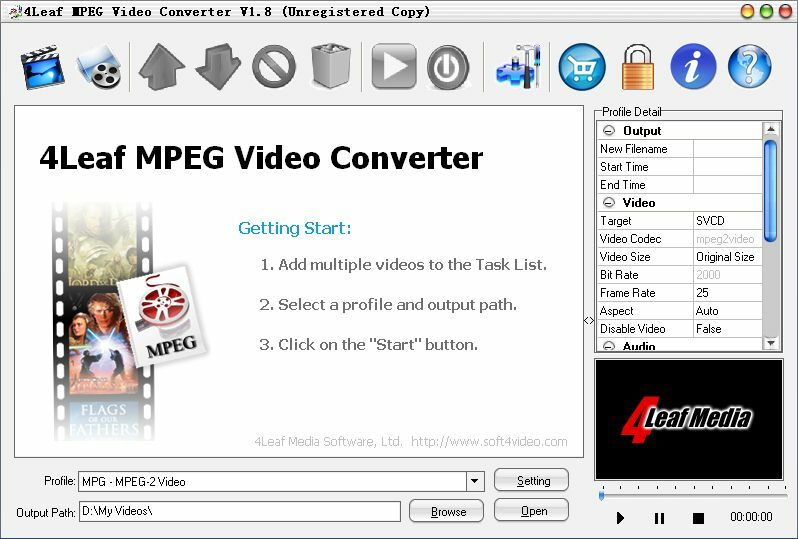 4Leaf MPEG Video Converter is a professional and easy-to-use MPG,MPEG-1,MPEG-2,MPEG-4 converter. 4Leaf MPEG Video Converter enables you to convert almost all video formats e.g. AVI, MPG, MP4, WMV, DivX, Xvid, ASF, MOV, VOB, etc to MPG,MPEG-1,MPEG-2,MPEG-4 with the perfect output quality. This program integrated with Windows Explorer is very simple and easy to use. You just need to right-click on video files in Windows Explorer to convert videos. 4Leaf MPEG Video Converter helps you to convert videos to MPEG videos. Qweas is providing links to 4Leaf MPEG Video Converter 1.9.3 as a courtesy, and makes no representations regarding 4Leaf MPEG Video Converter or any other applications or any information related thereto. Any questions, complaints or claims regarding this application 4Leaf MPEG Video Converter 1.9.3 must be directed to the appropriate software vendor. You may click the publisher link of 4Leaf MPEG Video Converter on the top of this page to get more details about the vendor.